I've thought about vote buying a lot over the course of my life. I'm not talking about how corporations and other affluent actors donate money to campaigns in hopes of swaying legislators' votes, or even lower-scale political patronage type activity. I'm talking about the phenomenon at the individual level in what is arguably its most base and disturbing form: The payment and acceptance of cold hard cash for one's vote in a particular political race or slate of races. My interest in vote buying goes back to my childhood. 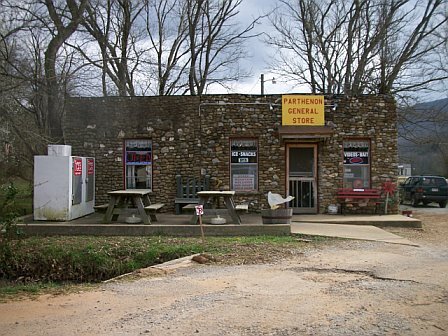 My father was involved in vote buying in the rural Arkansas county where I grew up, and he was quite open it. I recall rather vividly one election night when he and other local men gathered at our kitchen table with the paper ballots cast that day. If memory serves me well, they were checking to see if various people had, in fact, voted as they had been paid to do. This was in the 1970s and 1980s in rural Arkansas, where people still cast paper ballots; in fact, I think they still do in Newton County. My father was a life-long Democrat who bought votes on behalf of the party's local candidates, but the local Republicans engaged in the practice, too. Indeed, the Newton County Judge (in Arkansas, the county judge is the chief elected administrative officer) was convicted of vote buying in the late 1980s and spent some time in federal prison. U.S. v. Campbell, 845 F.2d 782 (8th Cir. 1988). Where did my father and his cronies get the money to buy the votes? I knew none of the people doing the buying were wealthy, and most--like my family--lived pretty much hand to mouth. Were they spending their own money? If so, what benefit did they get from electing the county judge or sheriff of their choice? Getting the nearest dirt road graded came up a lot in my mom's answers to this one, which suggests that vote buying is, in part, an exercise in political patronage. It simply bypasses campaign finance. How could the vote buyer be certain that the vote seller actually delivered his or her vote? I later understood the paper ballot system and its numbering better. This wikipedia entry suggests other ways in which votes were and are verified. So much for the secret ballot! In the Campbell case, the voter simply turned her absentee ballot over to the buyer. How many votes did you have to buy to sway an election? 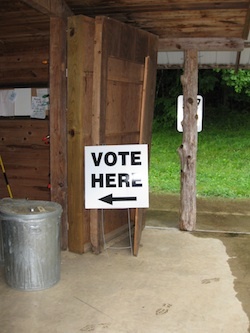 In a county where only a few thousand votes are cast in county-wide elections, not that many. As far as I could tell, most vote buying was focused on local races, as for sheriff, assessor. How much did a vote cost? Not much, apparently. I recall my mom telling me that it was as little as $5 or $10. According to the report in the Campbell case, the defendant bought various citizens' votes for as little as $30 each. Some folks held out for as much as $50. This story suggests a range of $10-$50 in eastern Kentucky, sometimes accompanied by whiskey or beer. Why would anyone ever sell his or her vote? As a young person, I was capable of great righteous indignation about various things, and vote buying was one of them. I must have taken civics class very seriously because I was truly outraged that anyone would sell his or her constitutionally endowed right to have a say in our great democracy. And yes, I also condemned the vote buyers. Now that I've been studying rural poverty for several years--especially the sort of persistent poverty that marks counties like the one in which I was raised (see a map of all persistent poverty counties in the U.S. here and note that 340 of the 386 of them are nonmetro)--I'm starting to see that the answer isn't (or isn't only) that those selling their votes (or for that matter buying them) don't share my vision of citizenship and democracy. It may well be that those selling their votes actually need the money--I mean, really need the money. Yes, even $10--never mind $50--may make a big difference in their lives, at least for that month. A recent visit to my mom in Arkansas and seeing the film "Winter's Bone" have both served to remind me of the value of a $20 bill in the rural Ozarks. All of this leaves me wondering: Is even democracy a luxury for the poor? Cross-posted to SALTLaw.org/blog and Legal Ruralism. Taking Rural People Seriously. Not. I started writing about rural people and places in relation to the law a few years ago, motivated in part by their near total absence from legal scholarship. I grew up in a very rural corner of Arkansas, where most of my family of origin still lives, and it struck me that lives like theirs (and formerly mine) were largely unseen and unacknowledged by legal actors at scales other than the most local (and sometimes even by those, e.g, the Sheriff). Rural residents comprise nearly 20% of our nation's population, but they are a forgotten fifth whose lives are in many ways different to what has become a presumptive but rarely expressed urban norm in legal scholarship. (Katie Porter's work on bankruptcy in rural contexts is an important exception). I started studying the legal relevance of rurality about a decade ago, and I have found so much to say that I have published only within the sub-discipline I call "law and rural livelihoods" since 2006. I expect to spend the rest of my career exploring rural people as legal subjects and rural places as context, even if it sometimes feels as if I am writing my way into the very obscurity associated with rurality itself. America’s poor and nonwhite urban neighborhoods. These are complex problems, involving powerful agricultural interests, difficult public health questions, urban planning, and civil rights. This is a nicely written manuscript about important issues that get surprisingly little attention in legal scholarship: agricultural policy, food, and child nutrition. But I was surprised and disappointed that in 51 pages, Lerman does not use the word "rural" a single time. Nor does he use the word "nonmetropolitan." The word "urban," on the other hand, appears thirteen times (more if you count the footnotes). He talks about farmers' markets, farm policy, the Farm Bill, Farmer Barack, and occasionally plain old farmers, but he doesn't mention the fact that a whole lot of food is grown in rural and/or nonmetropolitan areas. He talks about what is good for cities and urban children without acknowledging rural children, their families, their nutritional needs or their communities. On the one hand, Lerman's use of the modifier "urban" can be seen as progress. That is, by specifying urban people and contexts, he is at least not pretending to refer to all children when his real focus is those who live in cities. There is precision and honesty in this. Unlike many legal scholars, he is not merely assuming the urban; he's expressing it. This Article seeks to highlight some of the institutional practices that influence the adoption of a four-day work week, particularly those associated with sprawl. It compares the reform to school districts that operate a four-day school week as a cost-saving measure. School systems choose a four-day week because they are rural and long distances create particularly serious time and transportation costs. This comparison helps to reveal the role sprawl and its impact on commutes plays in the four-day work week reform. Professor Silbaugh uses "sprawl" as it is most commonly used now, to refer to a metropolitan phenomenon. Fair enough. Of course, the word sprawl is also an accurate descriptor of the lay of the land in rural areas. That is, one defining characteristic of rurality is low population density--residents far flung across often vast spaces. Kudos to Professor Silbaugh for seeing this link and acknowledging what might be seen as a rural "solution" to dealing with spatially dispersed populations: the four-day school week. What Professor Silbaugh doesn't do (presumably because her focus is the role that "urban sprawl plays in generating worker demand for a compressed work week and citizen demand for extended service hours") is acknowledge that the four-day work week (along with the upsides and downsides she identifies) would have similar impacts on rural families. Not only must rural children traverse great distances to get to school, rural women (and men) must traverse them to get to work. In fact, the rate at which rural mothers work outside the home is higher than that for their urban counterparts! Read more here. Of course, I appreciate (and greatly enjoy myself) the latitude that legal scholars enjoy to define their research agendas and to state the parameters of each article. It's easy for a reader to say, "but what about ...." Those "what about" questions can can go on endlessly, and they get in the way of the laudable goal of writing shorter law review articles. Nevertheless, some legal issues cry out for an acknowledgment of rural difference. Authors might ask how a given law would affect rural residents? or whether a law would operate in the same way in rural places? Taking our nation's rural population seriously is perhaps too much to ask as we move into the second decade of an increasingly metro-centric 21st century. But we could at least acknowledge the very existence of rural people and places more often than we do. In the context of legal scholarship, surely the rural experience is worth at least an occasional law review footnote. Progressive legal scholars, who generally seek to be inclusive, could start with that. Viacom sued YouTube for hosting material that Viacom claims infringes Viacom’s copyright. Yesterday, the federal District Court for the Southern District of New York handed down a summary judgment siding with YouTube. Judge Stanton’s decision seems a clear and logical interpretation of the DMCA. He spends a great deal of time focusing on the legislative history of the statute as reflected in the legislative reports before Congress. He does not dwell on some of the sideshow that developed during the discovery, including an email during YouTube's early period in which founder Steve Chen acknowledges that a substantial amount of the material on the site is infringing. That email demonstrated knowledge of infringement, but not the particularized knowledge that the DMCA requires. Otherwise, every web hosting service would be at risk--because copyright infringement is so widespread in cyberspace. It is too early for YouTube (and us netizens, more generally) to declare victory. The decision is likely but Round One. Viacom has the resources to continue the challenge on appeal. It might choose not to do so (1) if it believed it too expensive to do so; (2) if it believed that an appeal would risk creating “bad law” from its perspective; (3) if it believed that further publicity for its claim against a beloved website would antagonize its consumers; or (4) the litigation sapped too much executive time and energy. Assuming an appeal is filed, the Second Circuit Court of Appeals will review the decision below, based as it is purely on an interpretation of law, de novo. That means that Judge Stanton’s decision will receive absolutely no deference. The Second Circuit will review the issue entirely anew. It is too early to pronounce victory, but Judge Stanton’s decision marks a helpful first step. Anyone who is following the debate about immigration and its reform in the United States is familiar with rhetoric disputing what America's core values are as a means of supporting the competing visions for who gets to be an American—or, at least, who gets to be in America legally. Those opposing immigration talk about how the newcomers are changing America too much. Those in favor of more lax immigration laws remind us that the United States has always been a nation of immigrants. Nowhere is this debate being waged more vigorously than in what might be thought of as America's heartland. 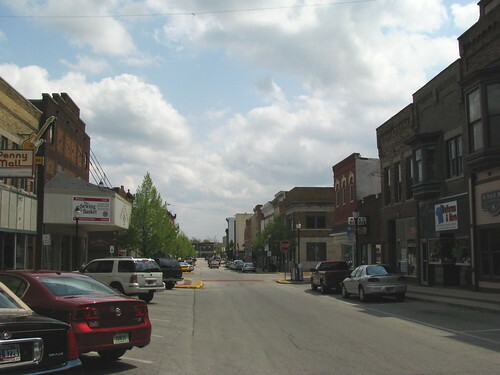 I was reminded of that fact this morning when I read that 57% of voters in Fremont, Nebraska, population 25,576, voted in favor of an ordinance that will "banish illegal immigrants from jobs and rental homes." One of the things that makes the Fremont ordinance unusual among anti-immigrant activity by smallish local governments is that residents demanded this referendum—taking the matter all the way to the Nebraska Supreme Court—after city officials voted against such an ordinance. Interestingly, the primary reason that the city's political leaders opposed the ordinance appears to be the litigation it is likely to prompt—litigation the municipality can hardly afford. Read more here and here. The New York Times reporting on these Nebraska events is full of small-town imagery and associations, such as the lack of anonymity that has caused community division over the ordinance to play out in especially personal acts of violence and vandalism. (Don't miss a related multimedia feature here). But what struck me most in reading Monica Davey's story today was the small-town, American values rhetoric being used by both sides. On the one hand, immigration foes in Fremont "complained that illegal immigrants were causing an increase in crime, taking jobs that would once have gone to longtime residents, and changing the character of their quiet city, some 30 miles of farm fields from Omaha." On the other, an opponent of the ordinance said it tells "the Hispanic community that the Anglo community is saying they are not welcome here. They thought they were coming to a small-town community with small-town values." This talk about "small-town values" and the "character of their quiet city" brought to mind the stasis and homogeneity that has typically marked many rural communities, even those like Fremont that have grown into micropolitan areas. It is not surprising that static and historically homogeneous populations would have a harder time than more cosmopolitan city dwellers adjusting to the changes immigrants bring with them. Current residents of places like Fremont may conveniently forget the Scandinavian or other European immigrants who founded these heartland communities a century and half ago. Others, however, see "small-town values" reflected in the charitable act of welcoming newcomers, of being good neighbors to them. These more welcoming residents often also appreciate the work ethic and family values that Latina/o immigrants in particular bring with them. (I have written some about these issues in the Harvard Latino Law Review here; related posts and news items are here and here). Thinking about events in Fremont—about this culture clash in the context of the American heartland—reminded me of the agrarian roots of these "quintessentially 'American' spaces" (quoting Steve Striffler, Neither here nor there: Mexican immigrant workers and the search for home, American Ethnologist (2007)). Jim Chen has written of the extraordinary influence of our nation's agrarian past (as well as its evil consequences) on law, and Barbara Pini has written of the moral high ground that farmers enjoy in the Australian context. In light of the power of the agrarian myth and its positive popular associations, isn't it interesting that so many immigrants are—in some ways—the heirs apparent of our agrarian past? They have become our agrarian present and future in the sense that they are doing so much of the back-breaking, low-paying work associated with intensive production agriculture and how and what we now feed ourselves—from picking crops to processing slaughtered animals. Read related items here, here and here. Just as interesting (but also deeply troubling) is how America's heartland has become the terroir (and sometimes also the site of terror) for immigration enforcement. Two examples are the National Cattle Congress-turned-immigration court that "processed" detainees from the Postville, Iowa (population 2,273) raid and the raid on a Smithfield hog processing plant in Tar Heel, North Carolina (population 70). (More examples are here). Obscure as rural America has become in our increasingly metro-centric nation, enforcement actions like these and anti-immigrant ordinances in places like Fremont, Nebraska have made rural America some of the most hotly contested terrain in our raging national debate over immigration. Draper facility, Utah State Prison. Ronnie Lee Gardner committed heinous acts condemned by all civilized people. Given a choice of methods of his own execution, he elected to face death by firing squad. The more intriguing decision is the fact that information is withheld from the executioners themselves. None of the five officers knows if he or she is the one who helped cause the death or if his or her rifle carried a blank. None of the five law enforcers knows if he or she is indeed an executioner. Why does the State of Utah deny this information from these officers? No one likes a bully. Bullies pick on the weakest, and the proper response to a bully is: Pick on someone your own size! However, legislation pending in the Arizona Legislature is taking a nasty form: bullying children with the threatened stripping of U.S. citizenship, even if the children were born on U.S. soil. To Arizona state Sen. Russell Pearce, SB1070 (the "show your papers" bill) wasn't enough to make his fears of undocumented immigrants abate, so now he is going after "anchor babies." If passed, "anchor babies" would not be issued Arizona state birth certificates, even if born on U.S. soil, a result at odds with long-standing U.S. Supreme Court cases and federal immigration law. When is enough too much? First, there is the "ratchet" problem - how do you know when you've tightened the screws enough? If "showing your papers" isn't enough, if stripping U.S. citizenship from the children of immigrants born on U.S. soil isn't enough, what is? Placing land mines on the border? For a 100-foot perimeter? A mile? How about poisoned water set out to entice those making a grueling desert crossing? Border sniper towers, 24/7? Xenophobic entrepreneurs selling "immigrant hunting" licenses? When is enough too much? Second is the "cutting off one's nose to spite one's face" problem. This is harder for anti-immigrant folks to grasp, because to them, undocumented immigrants are parasites eating away at Arizona's vitals and giving nothing back - they are a problem and the answer is exclusion. Exclude them by any means necessary - don't allow them to drive, find work, live, speak their mother language, form families or attend school. However, the truth is that the undocumented pay more into the system in taxes than they cost. Immigrant communities are models of entrepreneurialism - this has happened repeatedly in U.S. history. While not a model of an enlightened attitude toward undocumented immigrants, Texas politicians have courted the economic and political support of Latino communities. On the other hand, former Gov. Pete Wilson lost California for Republicans for a generation because he embraced the ultimately illegal Proposition 187, which would have denied state health care, education and welfare benefits to undocumented immigrants. The third problem is the "family values" problem. On Pearce's Web site, he trumpets his unabashed embrace of "family values." Fair enough, but in the context of proposed legislation withdrawing birthright citizenship, what do "family values" mean? Surprise Immigration and Customs Enforcement workplace raids, detention and deportation; exclusion of the children of undocumented immigrants from schools, and medical care that hurts communities composed of citizens and undocumented immigrants don't embody "family values." Are "family values" really served by sending undocumented immigrants into legal oblivion? Finally, what about the "800-pound gorilla" - the U.S. Constitution? There is more than a century of settled Supreme Court cases and federal immigration law establishing birthright citizenship. Even if Pearce and the Arizona Legislature might like to straitjacket the gorilla, this "800-pound gorilla" may not go that gently into the night. So Arizona, I have a question for you: Have you no decency? Knowing of my hobby of collecting pocket watches, my wife, Giovanna, surprised me by showing me a pocket watch made by the Tavannes company. The watch once belonged to her late husband, Martin, who was a professor of labor economics at UCD. Martin received the watch from his father. Both father and son were held by the Nazis in Bergen-Belsen, one of the most notorious concentration camps of World War II. Anne Frank and her sister, and the sister of actress Marlene Dietrich, died there. Martin’s father did not survive either, but Martin was there, hardly alive at 15 years of age, weighing 50 pounds and suffering from tuberculosis and other diseases, when the British army liberated the camp on April 15, 1945. 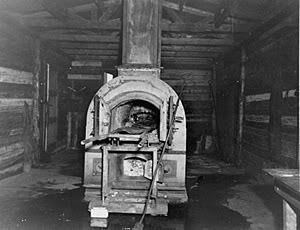 His task as an inmate and young teenager was to cart bodies to burial pits. Somehow, the watch had been successfully hidden from the Nazi camp guards. On liberation day, when a British soldier noticed the watch, he took it from Martin and gave in return a Mickey Mouse wrist watch. A sergeant nearby grabbed the watch and gave it back to Martin. When I looked at the watch, I saw a broken crystal, and I knew that the watch had not been used for at least 25 years or more. Obviously, the attention of a watchmaker was needed because the watch would require cleaning, oiling and adjusting along with a new crystal. 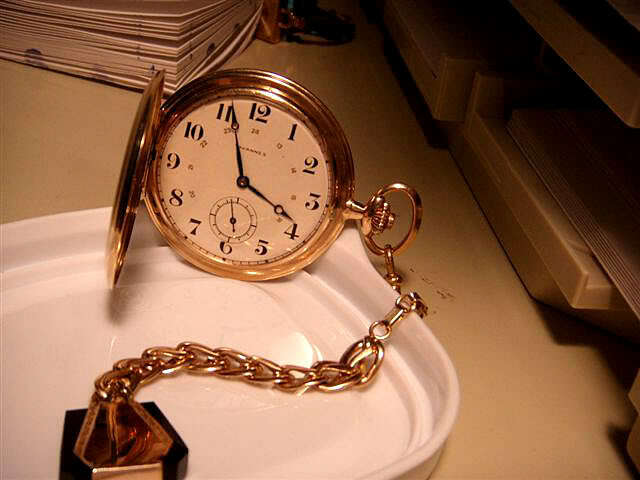 I immediately got in touch with my pocket watch guru, as I call Darryl Lesser of Darlor Watch up in Montreal, Canada. He has given me reliable guidance. I have bought three wonderful railroad grade pocket watches from him so far, and I know that he is a first rate watchmaker too. When I told Darryl the history of this watch and asked him for a quote on servicing it, his immediate reply was to instruct me to send the watch at once, and, further, he could not charge for servicing a watch with this history. In less than a week, the Tavannes pocket watch was serviced and returned to me, with a new crystal and obvious watchmaker’s attention to the case and movement. The watch is now in the hands of Martin’s son. Sometimes and item such as this watch is less important than the story behind it. I describe my experience as the joy of watch collecting. The new addition to the UCD law school building is almost a separate entity of its own, considering its size and the scope of its interior space. From my perspective of participating in the planning of the original building starting with architect's drawings, revising here and there, and dealing with heating and electrical engineers, interior designers and library furniture manufacturers, I can state that this new addition will be a complete success. The original building was named in honor of the Reverend Martin Luther King, Jr., and is referred to by most people as King Hall. Another part of the history of the building may be the surprise of learning that way back around 1970, plans for building an addition to King Hall were written up by Dean Ed Barrett as an interesting proposal to the Board of Regents. 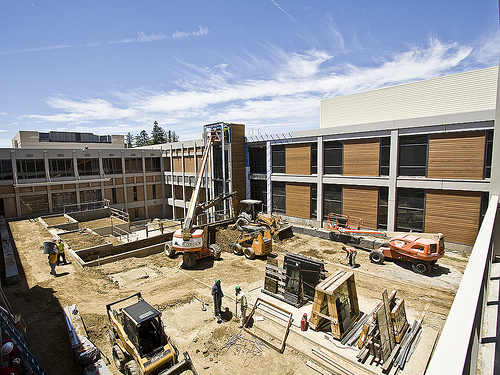 Major decisions such as which buildings would be constructed on any of the then nine campuses of the University were made by the University Board of Regents. The proposal was entirely the brain child of Dean Barrett. There was some stirring at University headquarters that the initial law school enrollment of 500 students would be doubled. Ed Barrett believed that a maximum enrollment of 500 students offered best educational advantages, such as greater and better exchanges between teachers and students, compared to a law school where the enrollment was 1,000 or more students. Both Boalt Hall in Berkeley, where Ed had been a faculty member, and UCLA, had law school enrollments of around 1,000 or more. Ed wanted closer contact among the law school community because he believed that it enriched the educational process. But Ed, because of his experience working in the bureaucracy as an assistant to the University president, knew that sometimes the best action would be to "join them if you can't beat them. " So Ed came up with a well thought out proposal. The first step would be to build an addition to King Hall so that 500 more students could be accommodated. This would involve more space for classrooms, more offices for additional faculty members and for administrative staff, and for student activities. There would also be a dean's office set up similar to the existing one. The shape of the proposed new addition was interesting too. King Hall is shaped much like the letter, "U". At one arm of the U are classrooms and administrative offices. The other arm of the U consists mainly of faculty offices. The base of the U is occupied by the law library. Ed proposed that the new annex be built on the west side of King Hall and consist of two wings that essentially turned the U into an H. The new quarters would serve as let us say, School B, the original building would house School A. The two schools would be competitive and complementary. Some subject specialties would be taught to both the A school and B school students by a faculty member who belonged to either the A or B school, but not both. School B would have its own dean. Both schools would be served by the existing law library. However, it was not necessary to "join them because you can't beat them." Somehow, the idea to double the enrollment did not happen. The proposal for this first new addition may well be buried somewhere in the filing cabinets or archives of the law school. Incidentally, did you ever notice that faculty offices on the outer side of the office wing are larger than offices across the hall from them? Originally, all offices were of the same square footage. But the outer offices had balconies about three feet wide extending beyond the outside wall of each office. This was a touch of the San Francisco architect who designed the building. No, no, was the reaction of some number cruncher up in Sacramento who checked all building plans against some rules about what could and could not be included in the design of faculty offices and other parts of buildings. The easy solution was simply to do away with the balconies by extending the length of each such office so that the balconies no longer existed.